It’s really amazing where photography can lead you. From a contact made via a photographer’s web site I was registered with I was contacted out of the blue in October 2008 by The National newspaper of UAE to do a photo shoot of a US diplomat, Cynthia Schneider, visiting Kuala Lumpur to attend a conference. The newspaper needed a portrait photo of to go along with an article they were preparing. My first reaction was to politely refuse as I had never done any assignment work for a newspaper before but wait a minute …. this was a Sunday, I had nothing else on, so what the heck I thought, let’s give this a whirl and see what experience I can gain. I had to call this lady who had just arrived in Kuala Lumpur from the Middle East and eventually got through to her mobile phone just as she stepped off the plane. Her schedule was tight so I had a 15-20 minute slot to shoot her in the lobby of the Sheraton Hotel. As she drove into town from the airport I grabbed my camera gear and drove downtown to meet her. I was thinking of a nice outdoor shot with perhaps the Petronas Towers as a backdrop and some good natural light … but this was not to be. A typical torrential downpour resulted in an inside shoot in the hotel lobby. It was a rush job so I posed her in a couple of locations in the lobby and shot off around 50 images some with flash and a number taken with natural light. I then rushed quickly home downloaded the images onto my MacPro and processed them quickly using my efficient Aperture workflow. The newspaper needed the top select images, annotated and keyworded, uploaded to their FTP site by early evening, Within an hour I had the images processed, rated, annotated, keyworded and uploaded to their site. The article was published a fews days later in The National newspaper and I must say it was extremely satisfying to see the finished chosen image in print. In July 2009 I was again contacted out of the blue from The National newspaper’s photo editor who needed photo coverage at the Women’s Islamic Initiative in Spirituality and Equality (WISE) Conference in Kuala Lumpur. 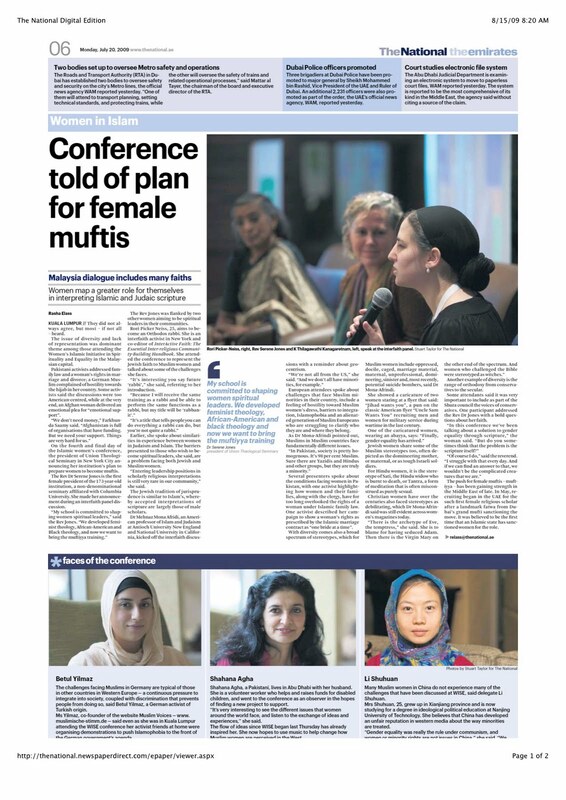 They had a reporter in KL covering this so I met with her and shot photos of her interviewees and general coverage of the conference which was attended by around 200 women from many different countries. My photos were used in the next day’s edition of the National with 4 shots chosen from the some 300 shots I had taken during the conference. During the WISE conference I also did some portrait shots of Imam Feisal Abdul Rauf, Chairman of Cordoba Initiative. He is the founder and CEO of the American Society for Muslim Advancement (ASMA Society) and Imam of Masjid Al-Farah, a mosque in New York City, twelve blocks from Ground Zero. As it happened he was a personal friend of Abdullah Badawi, the ex Prime Minister of Malaysia, and he arranged for the newspaper reporter I was working with to do a private interview with him. Of course they needed supporting photos so I was invited to cover this. Well what an opportunity! We had the pleasure of meeting with Abdullah Badawi at his residence in Putra Jaya and after the interview and photo session we were delighted to have dinner with him and his wife Jeanne. After dinner it was a rush back home around midnight to process the photos and upload them to the newspaper FTP site. 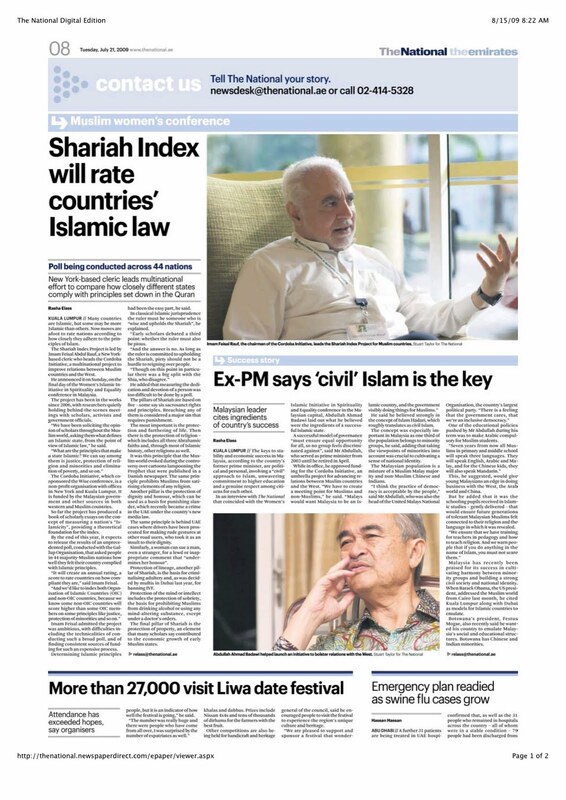 The article on Imam Feisal and ex-PM Abdullah Badawi was published the following day using two of my key shots. So this just goes to show that a simple photo assignment can lead to some very interesting and varied opportunities you would not normally have. What intrigues me about photography are the diverse locations and situations you can get involved with and this without doubt opens up the opportunity to gain some excellent photographic experience as well as sometimes having dinner in social circles you would not normally be in. In future I would certainly jump on any photographic opportunity …. you never know where you might end up.